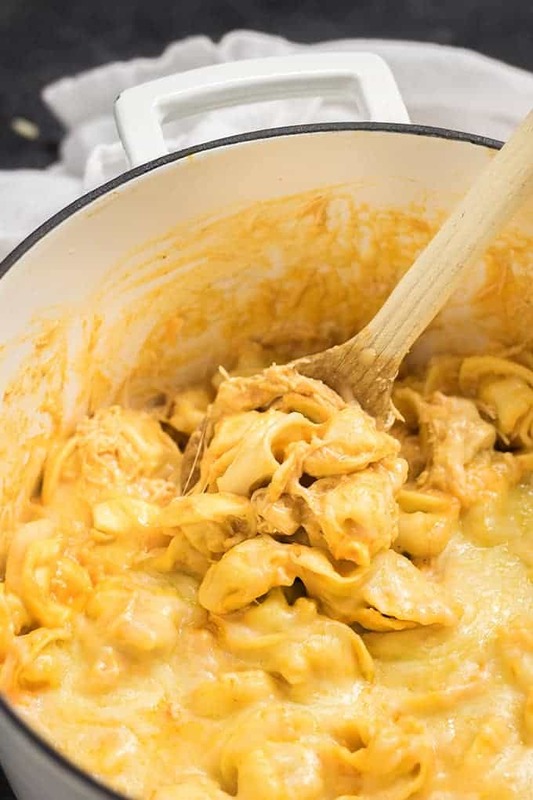 One Pot Buffalo Chicken Tortellini – this one pan pasta is an absolute MUST make! 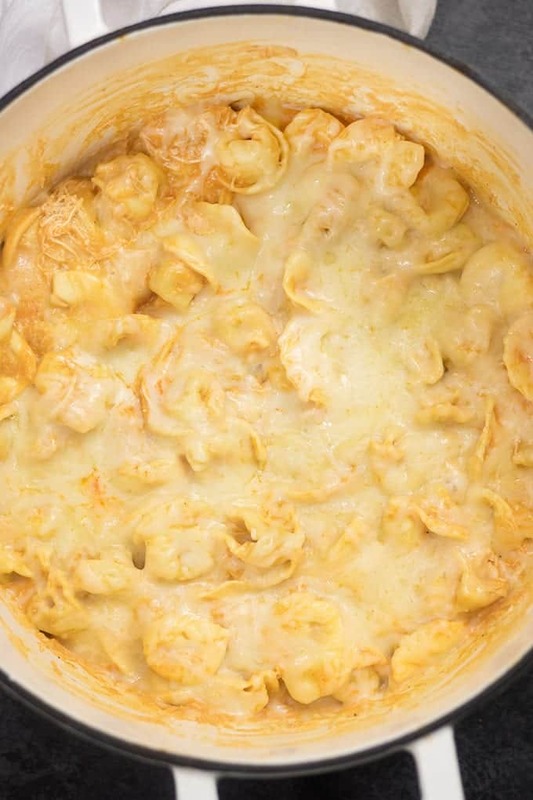 A simple 20 minute weeknight dinner, tortellini with buffalo sauce, ranch, and melty cheese! Guys. My love of buffalo/ranch anything has taken over again. I’m totally ok with it though because it led to this pot of cheesy pasta heaven. I’m still drooling over these Buffalo Chicken Taquitos. 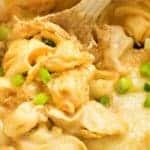 This recipe literally came about when I had a package of tortellini and kept going back and forth on what to do with it! Lucky me, I had a bottle of Frank’s Red Hot Wing’s sauce staring right back at me when I opened the fridge – sitting there right next to the tortellini, begging to be used. 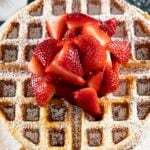 CHECK OUT OUR VIDEO OF THIS RECIPE BELOW! This pasta has me on a bandwagon that buffalo/ranch/cheese things should now have their own food group. Honestly, just forget the pasta and give me the sauce…..I can’t be alone here, right? Anyway, besides the sauce, this pasta cooks up SO creamy and it only takes about 20 minutes. And you only need one pot so you don’t have to spend your whole stinkin’ life doing dishes. 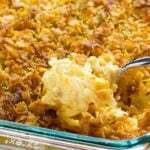 Please at least try to share this with your family – even though you’ll want to keep the entire pot to yourself. Seriously, Dan and I had a serious struggle – we could NOT stop eating this. Once I decided to be nice and share it with him that is. 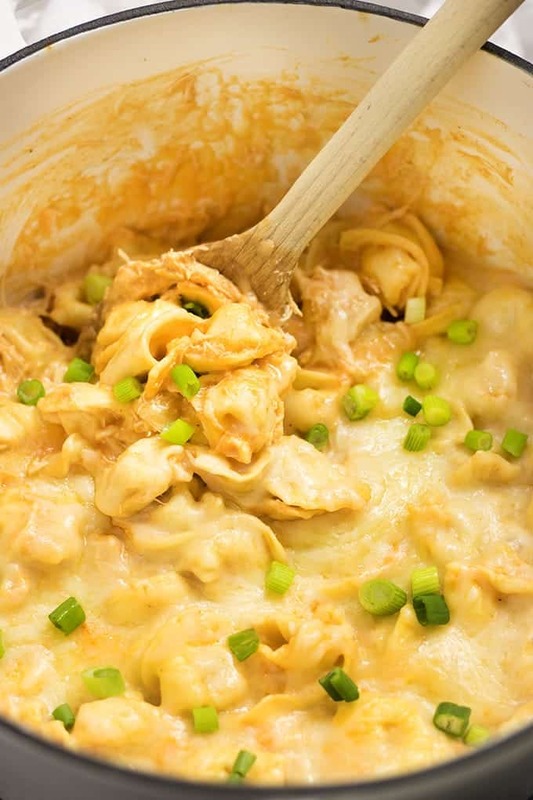 Enjoy your cheesy-buffalo-20 minute-pot of goodness! P.S. 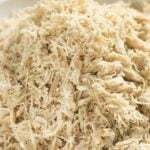 Make your life even easier and use this Crockpot Shredded Chicken for this recipe! Melt the butter in a large pan over medium heat. Add the garlic to the melted butter, and stir for about 30 seconds. Add the flour and whisk until smooth, about 1-2 minutes. Gradually pour the chicken broth into the pot while whisking constantly. 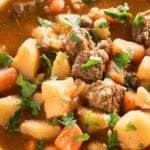 Allow the broth to cook for about 2 minutes, until thickened. Add the tortellini to the pan and bring to a boil. Cook for 4 minutes, stirring occasionally. 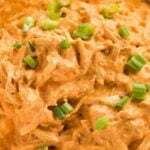 Add the shredded chicken, buffalo sauce, ranch dressing, and 1 cup of the cheese to the pot and stir well. Top the tortellini mixture with the remaining cup of cheese, cover the pot with a lid for 2-3 minutes, until cheese is melted. 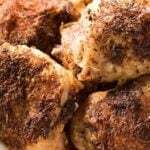 Made this for dinner tonight and it was amazing! Just like wings but with pasta… Yum! Will definitely be in the dinner rotation! Very creative, thanks for introducing something new and yummy for dinner! 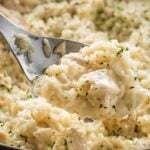 I wonder if you could sub the ranch dressing with greek yogurt and powdered ranch dressing mix — just to make it a tad healthier? Thanks! We’ll be having it tomorrow night. I can’t wait–just what I was looking for.